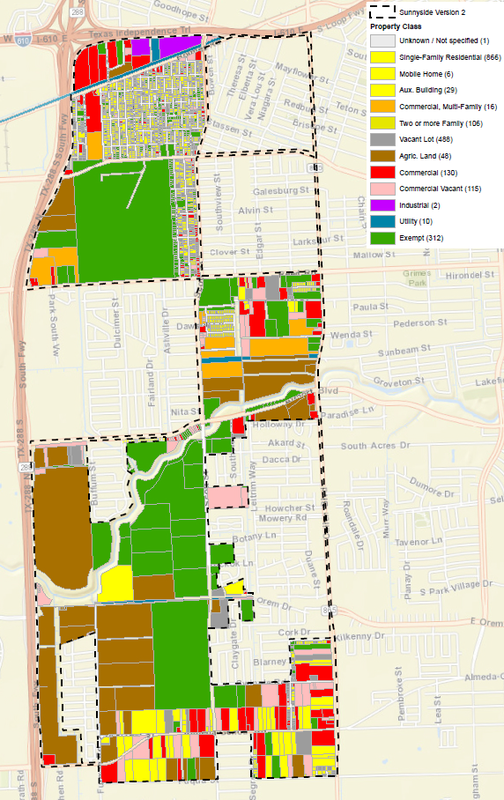 On Tuesday, the Houston City Council voted to establish a Tax Increment Reinvestment Zone (TIRZ) in the Sunnyside neighborhood, where we have been engaged in a resident-driven effort to attract more public resources and equitable services. The stated purpose of the TIRZ is to fund infrastructure improvements to attract new private investment. While this is one way to reinvest Sunnyside’s money in Sunnyside, it is not a permanent solution to Sunnyside’s problems. A TIRZ is a geographically defined area where future property tax revenue is reinvested back into the area to promote private investment. When a TIRZ is created, the total assessed property value in the district at that time is considered the “base value”. Taxes on this property value continue to be collected by the City each year. Since the City hopes the TIRZ designation will attract new businesses and development in the area, property values will increase, and therefore property taxes will increase. Taxes collected on the difference between the base value and newly assessed property values each year, the “increment”, go towards projects in the TIRZ, rather than the city’s general fund. TIRZ funds are primarily used to pay for infrastructure improvement related to new development, or pay debt that has been used to make improvements. The Texas state enabling legislation allows cities to create TIRZ districts for areas that would not otherwise attract market development, which are typically areas of distress with deteriorating conditions. When a TIRZ is created, a board is established and charged with creating project and financing plans for the length of the TIRZ. When the stated purpose of the TIRZ is realized, the TIRZ is supposed to be disbanded. A voter-approved revenue cap complicates the use of TIRZs in Houston, however. The cap was approved in 2004 to limit the amount of revenue collected by the City of Houston, thereby limiting government spending. When the City’s taxes hit the revenue cap, as they did in 2014, it triggers an automatic cut in the tax rate. 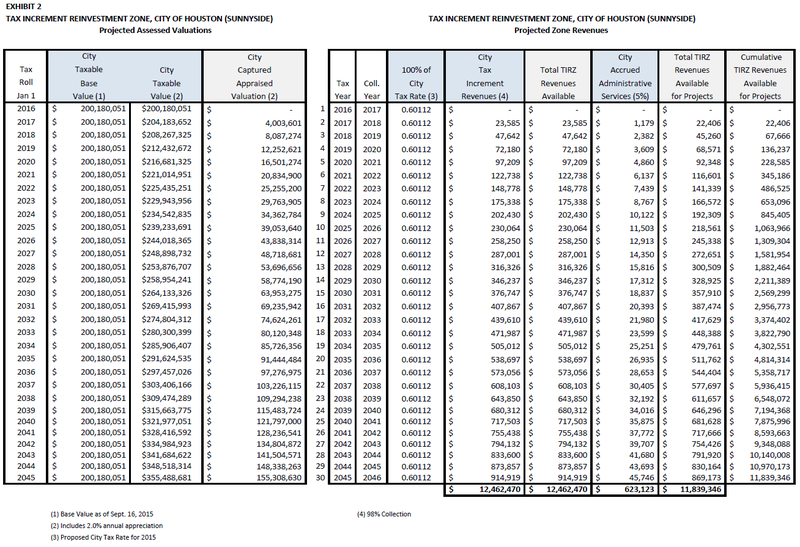 Last year the City missed out on $53 million due to the cut. Although the cap has since increased by an additional $90 million for public safety spending and increases annually based on inflation and population growth, the City is still facing a projected deficit next year of more than $126 million, largely due to an increase in pensions and debt servicing. The revenue cap has led officials to continue to lock up tax revenue in TIRZs, approving updated project plans to keep successful TIRZs running even though they have accomplished their original objectives. Of the now 26 TIRZs in Houston, only one has been disbanded. TIRZs in operation in high income areas (where one could question why a TIRZ is still in place today) effectively continue to collect ever-increasing tax revenue that must be reinvested within the zone in which it was collected. Without the TIRZ, the higher property taxes in high income areas would go to the City to address infrastructure needs across the city. Those needs are especially acute in low-income minority areas like Sunnyside. In successful Houston TIRZs, the rich keep getting richer. By allowing TIRZs to continue in higher income areas, the City is putting lower income TIRZs at a disadvantage. If a developer can get the same TIRZ incentive in a higher income, more established area, then they will choose higher income areas for development. According to the Preliminary Project Plan and Financing Plan, the purpose of the Sunnyside TIRZ will be to provide public infrastructure to encourage private capital investment in the area that “respects the character and culture of Sunnyside, offers a corresponding increase in the tax base, and creates economic opportunity.” This is to be fulfilled by enhancing and building new roads, stormwater, water and sewer infrastructure; developing and enhancing open spaces and recreational facilities; and promoting community heritage, culture and affordability. The total project costs come to more than $12.4 million. Approximately 42 percent will go towards roads, sidewalk, trails and right-of-way improvements; 39 percent to water, wastewater, drainage and other utility projects; 14 percent to open space, community facilities and cultural amenities; and 5 percent to administration costs. According to the financial plan, the full project revenue is not expected to be realized until 2045. While specific projects have not yet been determined, Sunnyside residents (and City officials) should not expect the TIRZ to solve all of the neighborhood’s many infrastructure problems. Capital improvements for drainage and street paving in the current Capital Improvement Plan often top $10 million spent on small subdivisions and major thoroughfares, so $12.4 million for an entire community is relatively little in comparison. Other TIRZs in low income areas in Houston have struggled. Taking inflation into account, property values have barely increased in Eastside, Harrisburg, Fifth Ward and Greater Greenspoint. Two lower income zones that have seen some success after TIRZs, OST/Almeda and Gulfgate, already had major attractions within the district or developer projects previously aligned when the TIRZ was created. Creating a TIRZ is essentially placing a bet that the area’s property taxes will increase. Using the “but for” test, one can estimate the impact the TIRZ will have on property values. “But for” the TIRZ subsidy, economic development would not occur at the proposed level only from private investment in the reasonably foreseeable future. If the TIRZ creation has little to no impact on property value, then the TIRZ will have no real benefit to the community and the City has locked property tax revenue in an area for no good reason. Require projects using TIRZ funds in high income areas to make at least 20 percent of housing units affordable. The City of Dallas has done this with the Skillman Corridor TIF District. Implement other incentives for economic development. A TIRZ is not likely to do that on its own. Tailor infrastructure investment to development projects interested in locating in Sunnyside, prioritizing anchor tenants and neighborhood-serving businesses such as grocery stores. Use TIRZ funds to subsidize grading and capping costs associated with the former landfill in Sunnyside. This large tract of City-owned land could be the location of the next master-planned community in Houston. The TIRZ could attract multiple developers to the tract and produce badly-needed services such as medical facilities, a grocery store and recreational and entertainment centers. Consider other reasons private investment may not be choosing Sunnyside and design projects accordingly. Offering infrastructure is key, but perhaps businesses are avoiding Sunnyside due to perceptions of high crime or workforce lacking the desired job skills. Consider using TIRZ funds for workforce training, crime deterrence or day care. Establish a higher standard for community engagement for all TIRZ boards as it relates to creation of project plans, future expansions, and other board business. An unelected board deciding how to use taxpayer money should have as much public participation and transparency as possible. Sunnyside faces some really difficult challenges. The TIRZ is one tool at the end of a long list of tools that could help improve this community. But the payoff is in the distant future. Let’s not allow the new TIRZ to become a distraction or a pacification for a low income, minority neighborhood. A TIRZ is not the solution to Sunnyside’s problems. This entry was posted in Local issues and tagged Houston, Sunnyside, TIRZ. Bookmark the permalink.